ðŸš‡ Kings Cross station platform 9Â¾ & Harry Potter shop is wizard! Obsessive Potter fans visited Kings Cross station & took so many odd pictures of platforms nine & ten that eventually the station master chopped a cart in half & stuck it against a wall as a diversion. It was a bit out of the way along an annexe to platform 11. The trolley had been requisitioned from the taxi rank, sawn in half & was still emblazoned with an advert on the back for Capital Connect. To add to the authenticity sometimes it even got vandalised. â€˜Rashell was transportedâ€™. Brilliant. So they gave it protection. It was relocated to the train shed on platform 8. It looked rather nice there, disappearing into a bricked up arch, but was behind ticket turnstiles and the brickwork became worn from people hurling themselves at the wall attempting to breach the barrier whilst it was sealed. Duh. As more visitors were drawn to the station to see the trolley, it vanished. And in fact regenerated. Now began the battered film trolley, complete with Harryâ€™s trunk, crowned by a half owl-cage. It was hotly followed by an extensive Harry Potter shop. 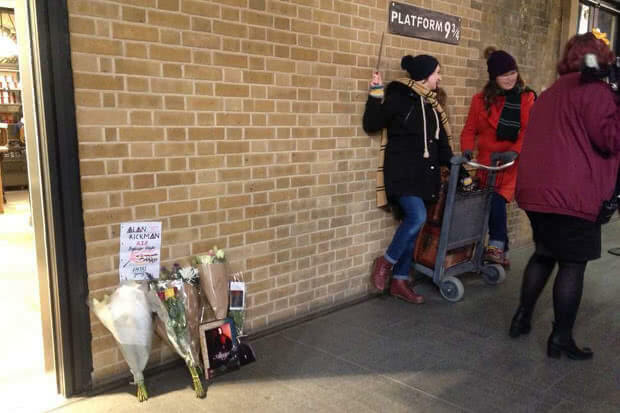 Platform 9Â¾â€™s mutilated Muggle trolley has now blossomed into a time-chomping tourist attraction. 45 seconds: Dumbledore and Newt Scamander explain the Platform on Hogwarts day. According to Newt the best thing about Hogwarts is you donâ€™t have to do Physics! It can range from under 15 minutes on wet days outside school holidays to 90 minutes. It is the cheese and you are mouse in their trap. But take heart for the cheese is delicious, harvested from the ripe teets of an Acromantula by Dobby just for you! Donâ€™t worry Iâ€™ve devised a quiz for you with professor Snape - he's a lovely. If youâ€™re waiting with company it is actually more fun to get the answer wrong. Ron and Harry often did. Mornings are the only respite from the queue. Opening time, trail blaze. In the evening it just gets loooonger. Imagine 90 minutes in the heat and set your House Elf to wake you. If youâ€™re going to Warner Brothers Harry Potter studio tour anyway and you canâ€™t forfeit a lazy morning, then your heart will still beat if you skip it. Cost money, you have to spend a penny, 100 of them in fact - Merlinâ€™s beard. So go before you go. It's most fun just walking around, drinking in the sight of the award winning concourse roof. Theyâ€™ll pose you with a scarf for a windswept look. The quick shutter on their DSLR cameras are more able to catch leaps and fluttering scraves than sluggish smartphones but it's not inexpensive. Â£10 for 1 photo, Â£15 for 2, Â£20 for 3. I wish I could emulate gusty Quidditch match scarf action for my tourâ€™s photos. Get Doxies to cling to one end of the scarf just off camera and flap them up and down. Iâ€™ve tried, but they just kept biting people. Buggers. If you don't want their photo, solicit their assistance, add â€˜but can you suggest a pose?â€™. Leaning into their suggested poses will earn you frolic-some photos and they have such grace. If youâ€™re with children and have waited a good while, this will be a suitable cap-stone to it, the horror of the Potter shop prices is merely an epilogue. Well Kingâ€™s Cross is where most of the films were filmed for Harryâ€™s crossing to the wizarding world, itâ€™s more authentic than the recreated Kings Cross at the Studios, and the posed photos with scarf flying, are not available there. Donâ€™t grieve. The main event is Edinburgh, the creative heavy lifting and greatest number of inspirations lie upon the trains route. In 2012 Professor Flitwick / Griphook, aka dwarf actor Warwick Davis, opened the Platform 9Â¾ Harry Potter shop. Standing in front of the ribbon strewn entrance, scissors in hand, talking to a forest of tall legs crowded before him he remarked "Levitation would be very useful right now". â€˜Ah you shabby bum get-oot-itâ€™. GAP speak in Scots. Your eyes will swim at the incredible range and your heart sink at the price tags. Itâ€™s the Weasley experience, youâ€™ll feel like Ron in Honeydukes. â€œI want! I want! No wait - No I donâ€™t, no I donâ€™tâ€�. The range, itâ€™s bursting, if youâ€™re not Gryffindor your house is present too! It is extensive but incomplete. I desperately wanted an Alastor Moody rotating mad eye, they didnâ€™t have one. Sadness. People complain itâ€™s expensive, but itâ€™s near standard licensed merchandise prices, 3 Harry Potter sweets for Â£10 is remarkable compared to the Studio Tour. You've got to have a dirt flavoured Berty Bott at least once. â€˜Iâ€™m a wizard fool, behold my might!â€™. Has a smaller sister shop, so you donâ€™t have to cart your pillage around your whole trip. Are you the Weasley clan? Cash strapped with kids? Then the shop is your Forbidden forest, the cashier is Aragog, face your fear! What you could do is buy a jacket in your children's house colour then ask your charges to select the Hogwarts badge that youâ€™ll sew upon it. You can let them choose where on the jacket. You can sell it on the fact the shops donâ€™t really sell jackets and thatâ€™s what they need for watching Quidditch action up in the Highlands. The shop has soft and hard back illustrated editions of the books, thatâ€™s a gift which will be savoured for a bit and you could enquire about as the kids progress. If they've just seen the movies this would be a special place to buy and launch into the books. If you donâ€™t know what house they are, you can purchase non-housed clothing, with the Hogwarts crest on and the shop has it's own platform 9Â¾ logo'd merch. It's popular with Chinese who don't do the Pottermore test so much. Every year On September the 1st the eyes of the Western world focus on Kings Cross. In the books witches and wizards traverse the King Cross station concourse for admission to platform 9Â¾s to board the 11am Hogwarts Express. Travelling upto Hogsmeade station in the Highlands. Every year this is celebrated by a new generation of Potterheads. Sometimes it can be doubly special, in 2018 Dumbledore (Jude Law) and Newt Scamander (Eddie Redmayne) from Fantastic Beasts joined the celebration. The epilogue of the Deathly Hallows has Harry, Hermione and Ron deposit their kids on platform 9Â¾ for their first year at Hogwarts. The title of the chapter is â€˜19 years laterâ€™, it being nineteen years since the bloody, terrible but conclusive Battle of Hogwarts. JK Rowling finished the Deathly Hallows in 2007, and these events take place in the year 2017, on September the 1st, â€˜Hogwarts dayâ€™. Dedicated Potter-heads networked and planned to mark this occasion months in advance. JK Rowling however was even earlier. Ah bless, the play bends time, just a bit! For 19 years later Pottermore celebrated this special anniversary by launching their Hogwarts Experience. You can sweep around the castle of Hogwarts, lake and Hagridâ€™s hut on a broomstick. A good way to entertain yourself in the queue. Well itâ€™s remarkable, new year for Potter-heads. However if you want trolley photos or to go mad on merch - Fahgettaboudit. Well there is one hope. Buy a skip the queue lanyard online, Â£15, have it sent out. If you're with a group this works out good value, better than queueing 2 hours. And 1 professional photo is included. This is a great gift for a Harry Potter fan if they can visit on Hogwarts day, because youâ€™re buying them a memory, youâ€™ll deserve a Hagrid strength hug. and thereâ€™s a group of you, itâ€™s also best to pony up for the skip the line. A pass can be bought in the shop. Itâ€™s a better story than â€˜the queue was too long so we skipped itâ€™. If visiting at weekends and thereâ€™s a mammoth queue, be decisive. It maybe worth buying a lanyard in the shop, rip that plaster off! 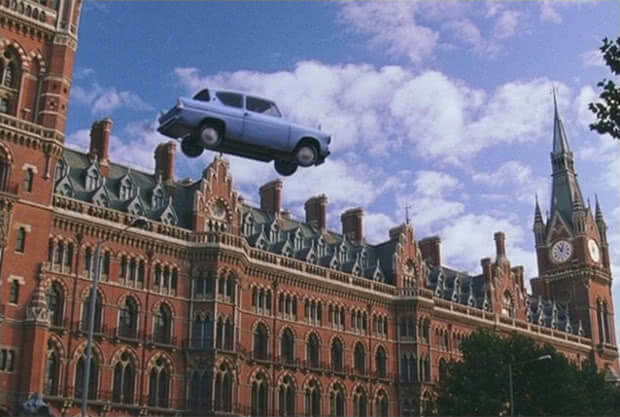 In North West London lies Kings Cross Station, a Muggle railway station that is one of the busiest in Britain. Itâ€™s a perfectly ordinary station, with big plastic numbers over each track and guards who have never heard of Hogwarts School for witchcraft and wizardry. However, every September 1, as the clock overhead approaches eleven oâ€™clock and the InterCity 125 pulls into platform nine, a strange crowd turns the occasional head. The crowd is wizarding children and parents pushing trolleys of enormous trunks & caged owls, making their way toward a solid metal barrier between platforms nine and ten. A Muggle clothed Obliviator stands by to erase the memory of any unusual Muggle who notices too much. Molly Weasley advises itâ€™s best to run at the barrier if itâ€™s your first time and so Ron & Harry do. Straight through the metal their bodies pass. On the other side they appear on a platform beside a gleaming scarlet steam engine billowing smoke. This is the Hogwarts Express and Harryâ€™s heart is on itâ€™s way home. A look back at the barrier reveals it is instead a wrought-iron archway with the words â€œplatform nine and three-quartersâ€�. A sign announces that the Hogwarts Express departs at eleven oâ€™clock and the platform has a distinct smell that lifts the spirits of young wizards. Each summer theyâ€™re trapped beneath the parental boot and banned by the Ministry of Magic from performing magic, they look forward to the start of term - freedom and mayhem. The platform is a swirl of activity. Steam from the scarlet engine warms and soots the faces of young witch and wizards while cats wind their way around their legs and owls jostled about in their cages hoot their dissastifaction to one another. Hordes of parents bustle their kids through the steam â€œlike dark ghostsâ€�, their voices carrying through the mist. Finally, at 11:00 a whistle sounds and the hiss of the pistons fills the platform as the train creaks and crawls forward. Younger family members and parents remain on the platform waving their children off to the finest school of witchcraft and wizardry in the world. Hogwarts. Nobody returns to the platform then, for months, until the end of term, when it once more bustles with witches and wizards while a wizened old guard sits by the iron archway back to the Muggle world making sure everyone gets home without attracting too much attention. How many times a year can platform 9Â¾ open? Like when Hogwarts was shut during world war 2? Snape: Not the Book of Admittance's finest hour. Snape: If you're entertaining ideas of graduating Hogwarts this year best not to follow master Potter's example. The platform is normally used six days a year; round trips for the beginning and end of term, as well as the Christmas and Easter holidays. When families arrive to depart the sign says 11.00, get your rush on if youâ€™re late, this presumably changes for other departures. Harry prefers the freedom, dangers and excitement of Hogwarts than the tyrannical Dursleys. Who helps Harry through the barrier during Harryâ€™s first expedition to the platform? He just says itâ€™s all on the ticket, in a rather blase way. Harryâ€™s failed by Hagrid's expert blinkers. It must be so very fine to be born believing you are the centre of the universe, perfection has been acquired and learning is a needless bauble. Young Ron was wrapped up in the banter of his family. Harryâ€™s troubling anxiety is relieved from the trial of finding the platform by Molly Weasley, the supreme matriarch of Harry Potter. Rowling establishes her maternal nature quickly with Molly asking "Now, what's the platform number?" to her daughter Ginny. Like crossing the road sheâ€™s ingraining important things in her youngest memory. It builds credibility that her abundant love could take in Harry and Hermione, but never Fleur Delacour - there has to be some limit. In 1993 when Harry returns home he is collected by tyrannical Vernon Dursley, how does he master him? No, if he did this heâ€™d be thrown before the Wizard Gamot, expelled and have his wand snapped. Being so disgraced would be worse than being a wizard wannabe Squib like caretaker Filch. Jeez, Muggles. Puh, no Werewolf would eat Vernon, heâ€™s all fat. Yep Harry says heâ€™s "a convicted murderer, but he's broken out of wizard prison and he's on the run". I could feel the blood draining from poor Vernonâ€™s face. It was blissful. In 1995 this got even worse, who threatened the poor square Dursleys? Harryâ€™s godfather is dead, itâ€™s very sad. Yeah, dead intimidating those two clowns. The Twins are good for invention, bravery and thickening the ranks, but try some more. Oh my poor Vernon! Pretty much the whole order of the Phoenix. They say if Harry was mistreated in any way, one of the Order of the Phoenix would be sent along to see them. Harry needs peace and support after his Godfatherâ€™s death, my heart burst with love for them. On 1 September 1992, Ron and Harry ran at King's Cross 9Â¾'s barrier to return to Hogwarts and collided with a brick wall. Why? Well thatâ€™s what I thought too, â€˜oh no, theyâ€™re late!â€™, my heart sinking. Thatâ€™s what happens when you donâ€™t have goody-two-shoes Hermione around to boss you. But nup! Yeah right, then Slytherin will sweep the Quidditch field. You need to bone up mâ€™witch, on my tour. Yep, the maverick House Elf blocked the magical barrier dividing Platforms Nine and Ten in order to prevent them attending Hogwarts. It's not the only disaster to afflict the platforms. In 2015 a joy riding Muggle train driver (or perhaps just fallible), hit the buffers at speed, turning the passengers into fleshy cannonballs. 14 people were injured and the tea trolley never recovered. Wonky wheels, it was demobbed. Why did Rowling choose platform 9Â¾? While he was sleeping Potter's head must have accidentally filled with Madam Pince's gilting, how else could he spout such gold? You can bring a blast ended Skrewt to water, but with Potter there's no hope. She's all about the sonics. Rowling could have had the Hogwarts Express depart from platform 12, there being only 11 Muggle platforms, however the Wizarding world fits secretly in amongst the Muggle, so she decided it would be fitting to have it between platforms, therefore a fraction. JK Rowling liked the sound of Â¾ which is why that became the Hogwarts platform. â€˜Kwartâ€™ nice crunchy anglo-saxon sound. So why nine? Perhaps Queen Boudicca. On her scythed chariot she resisted the Roman conquest of Britain from AD60, going so far as to destroy â€˜Londiniumâ€™ as the Roman army fled. It is claimed she lies buried somewhere beneath platforms 8-10. The Wizarding world also eschews the march of â€˜civilisationâ€™ and departs for their school in a similar region. Well eschews apart from Arthur Weasley, but best not talk about Arthur. Why was the Hogwarts Express created? Tell me Potter when you come to a stop outside my classroom does that mighty brain of yours ricochet off the inside of your hollow head? They got there just fine already. Another incisive answer from master Potter, illuminating the ways of his unfathomably dense mind. Yes, every September as term began the skies of Britain were filled with broomsticks, trunks and cauldrons dangling, Thestrals, flying carpets; kids were dropped off by parents, who then flew home. The Muggle sightings were not the least of the problems, and so Minister for Magic Ottaline Gambo stole the Express from a construction crew in Crewe. What other platforms did JK Rowling imagine? 7Â½ had the Orient Express to wizard only villages in continental Europe, night-busing it down the Euro-tunnel no doubt. Perhaps Celestina Warbeck, Molly Weasleyâ€™s favourite singer, would have a platform for large concerts. This would be conjured up as required by the Ministry of magic and admission would be controlled because only folk with tickets would know the platform number and the times to enter. Maybe it would open for Quidditch world cup too, Portkeys are a little trying. Not in the wizarding world, but in 2010 the station opened a platform 0 beneath the station on an old taxi rank; in time for the 2012 Olympic traffic and to use as a stand-in during refurbishment. Canny Muggles. Why did JK Rowling choose Kings Cross station? Yes trains to Caledonia - the Highlands, leave from there. Granger goes to the library and she completes another interminable homework. Potter goes to the library and what's the point? Blerrrg. In the 80s when Rowling briefly worked in London it was the architectural equivalent of vomiting slugs. The gothic splendour of nearby St Pancras international, which they used in the films, conjures the soul-stirring romance of rail travel. What platform does Daniel Radcliffe have to find to board the Hogwarts Express? Potter's ego is like a landmark to steer your broomstick by. Although it is not entirely unfortunate, we can all enjoy the fireworks come next term's OWLS. Nope, Platforms nine and ten are not in the main station building, but in a little annexe to the side. The arched passageway to these platforms was where the first celebratory Platform 9Â¾ sign at King Cross was placed, but it was not where Daniel found the Express. Do you think they realised itâ€™s a grade I listed building? â€œI wrote Platform 9Â¾ when I was living in Manchester, and I wrongly visualised the platforms, and I was actually thinking of Euston, so anyone who's actually been to the real platforms 9 and 10 in King's Cross will realise they don't bear a great resemblance to the platforms 9 and 10 as described in the book. In fact, even at Euston station platforms 9 and 10 are also adjacent meaning that once again, there would be no room for a magical brick wall! This is not where the movies were filmed. It's like a Leprechaun and a Jarvie had a baby and then beat it in the head. Only in the final film. â€˜Platforms nine and ten are not in the main station building, but in a little annex to this side.â€™ Craig wanted to showcase the stationâ€™s Victorian architecture & get a strong image. 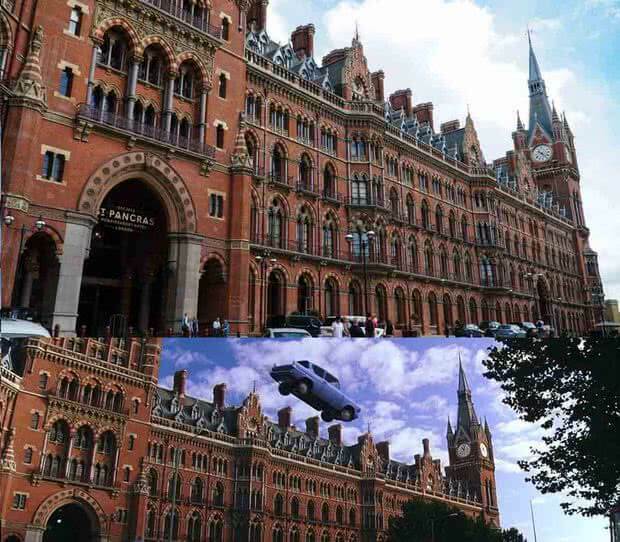 Where was the exterior of Kingâ€™s Cross filmed? Nope, the brick walls mirror the steel arches of the railway shed within, but to the gothic sensibility of the wizarding world, King's Cross station is essentially a bungalow. Ah youâ€™ve been paying attention. And now youâ€™re a blockhead. Evanesco blinkers! (vanish blinkers). What happened at Kings Cross on 1st of September 2017? Every year I receive and instruct the finest minds in the wizarding world, the fruit of their generation. And then there's Potter. The golden trio's children head to Hogwarts. For the first time! And Scorpius Malfoy too, I canâ€™t wait till you see the Cursed Child! Merlinâ€™s beard, practice your cheering charms. What is Kingâ€™s Cross for Harry Potter? Ahhh, pass me a Troll-hanky. The same could be said for another orphan, Thomas Riddle. Ah OK, well if it were a lot cleaner and emptier and had flayed Voldemort babies beneath seats. In Greek mythology when people die they traverse the River of Styx, itâ€™s their last travel. Charon, the ferryman, ferries the souls of the dead across the river into the underworld, but he requires payment. He locates a coin traditionally placed in the mouth of the dead. Without payment, Charon leaves the dead, they do not get into the underworld and are left on the shore to drift for 100 years. For wizard Harry a train-on, from Kings Cross is more meaningful, Kingâ€™s Cross bookends Harryâ€™s adventures, and death would be the next. Indeed when Alan Rickman died a shrine was dedicated to him there. "Make your own unique messes and then work your own way out of them". It could be, itâ€™s all new, Lucious stalks the platform. Itâ€™s hardly protected from Voldemort. But after the terrors of the Dursleys, Harry is refreshed for a year of adventure and mayhem. It also speaks to his Gryffindor temperament that the worry of the unfamiliar is perceived as an invitation to escape and adventure. How many people have been injured running headfirst into a wall to gain access to a 1st class wizard education? Think Harry Potter readers are a sensible crowd? Come now, our hearts beat louder than our brains. Sure, not everyone can be a Gryffindor whose pursuit of glory equates to brain injury. â€˜Run my honeys, run, runâ€™. Because of this, a slightly brighter fake replica wall now protects the original Victorian wall to prevent further damage to the grade I listed building from kamikaze Potter-heads. Our illustrious headmaster says he would never presume to know all of Hogwarts secrets. I must agree; however did I come to possess a wooden beam as a student in my class? The Midland railway company used a silver Wyvern as itâ€™s coat of arms, a kind of legless dragon creature with a reptile body. Built in 1868, a Victorian gothic masterpiece, it connected London with yon empress of the North, Edinburgh. The railway made most of its money from freight and made thrice daily ale runs to the Bass ale factory. 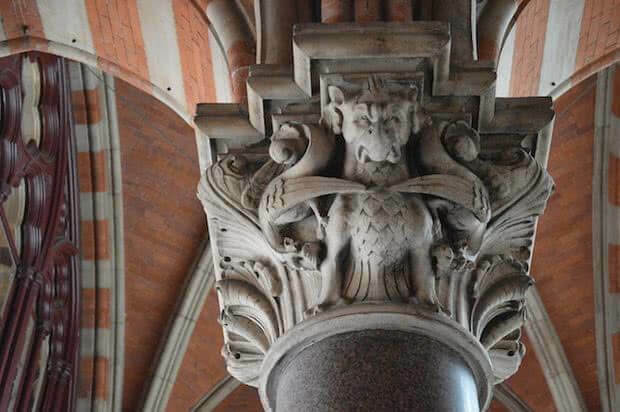 So important was this trade to the capitalist and so beloved was Bass by their employees that the columns supporting the station were built 3-barrels wide matching the design of the brewery. It's named after the railway company that founded the station. In the 1870s it was the grandest hotel in Europe featuring such novelties as revolving doors and hydraulic lifts, but didnâ€™t include bathrooms. A legion of house elves were required to carry chamber pots and in 1935 the gigantic running costs led to its closure. Interest from Harry Potter helped revive its fortunes and along with the rest of Kings Cross it has gentrified. â€˜The meeting placeâ€™ or â€˜lovers statueâ€™ now decorates the ground floor, originally the couple kissed, but British reserve prevailed and the lovers knock heads. Your mission? Parody the pose. On the Eurostar level is Europe's longest Champagne bar, beneath the glass railway shed canopy. It can get a bit chilly so ask for a blanket. I went there for research for my Potter Tours and itâ€™s an interesting experience, as secure as Gringotts and no less lavish. Its collection dates back 2000 years and they have a free permanent exhibition, Treasures of the British library. It showcases the highlights including Magna Carter, Beetleâ€™s Lyrics and the notebooks of one of JK Rowlingâ€™s favourite authors Jane Austen. OMG these are fabulous. Accessible all year, come dressed to enter or bring a towel because this is just too wonderful. There's an app with games like snake enabling you to interact with the fountains. Fun and interactive, if it's working this may well be the highlight of your visit. Horseradish, G&T, Bloody Mary too! In an old Midland railway goods shed near the fountains is Ruby Violet. The parlourâ€™s price board echoes the station departure board and they claim to be the wizards of ice cream. Indeed taste buds do Apparate. Ruby have manufactured grassy hillocks for lounging with a cone while inside the parlour is designed around a sinuous wood table dredged from the bottom of the Panama canal, the perfect place to eat a Macdonalds. A wetland park that climbs up from the canal. From Spring 2019 escape the madding crowd with a breath of nature on your return journey. Tranquil Regentâ€™s canal is accessible from the park and is nicknamed â€˜Little Veniceâ€™; in the sunshine itâ€™s a blissful slice of peace. The concourse roof is the longest single span station structure in Europe, the semi-circular glass canopy is supported by 16 steel â€˜tree branchesâ€™ radiating from a central funnel. It stretches 54 meters from the train sheds and is composed of 2000 triangular roof panels, half are glass to illuminate the historic 19th-century brick facade, placed to avoid glare on the information displays. The creation of the concourse demolished the old shabby and â€˜temporaryâ€™ enclosure from the 1970s. It revealed the classic 1850s brick frontage, mirroring the steel arches of the railway sheds. The rennovation won Kingâ€™s Cross station the European Union heritage prize for conservation. Tour for Muggles, visit the Harry Potter sights in London on this 2Â½ hour walking tour. The Hogwart's Express essay on Pottermore. 'Platform 9Â¾ in Harry Potter' owes a vast debt to the Harry Potter wikki, I salute you fellow Potterheads! Harry robbed treasure from Gringotts and so have I, but hopefully nobodies harmed.